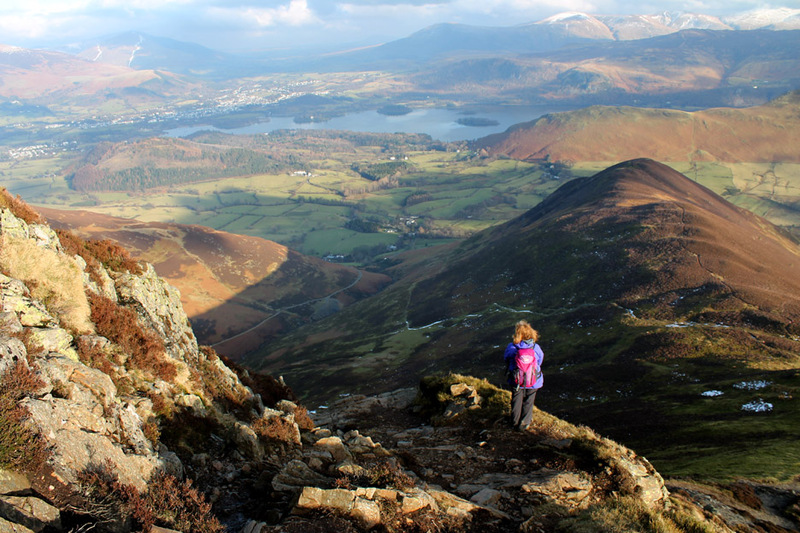 " Causey Pike on Valentine's Day "
Date & start time: Saturday 14th February 2015, 12.50 pm start. 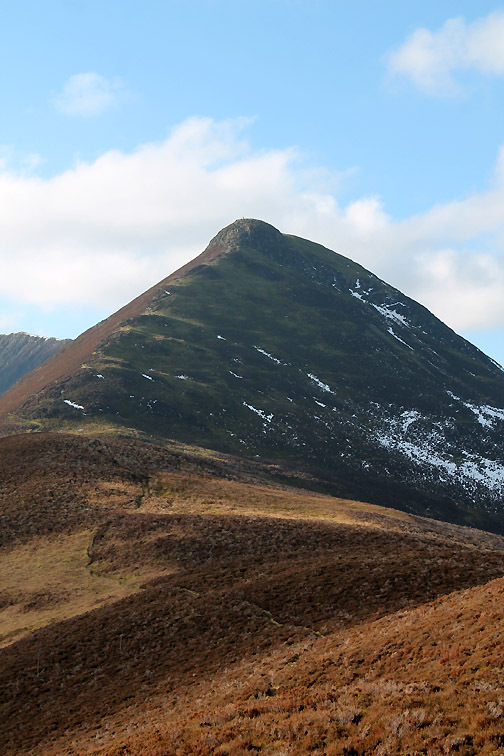 Places visited : Rowling End, Causey Pike, High Moss, back via the Miner's track. 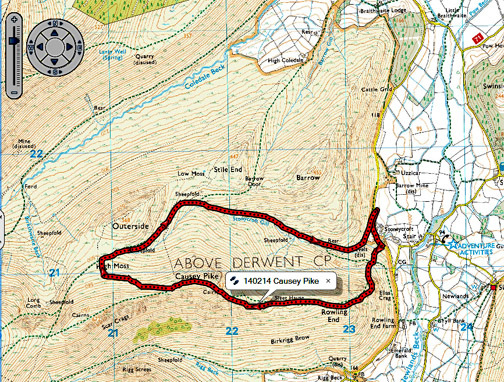 Walk details : 4 mls, 1850 ft of ascent, 4 hour 10 mins including lunch. 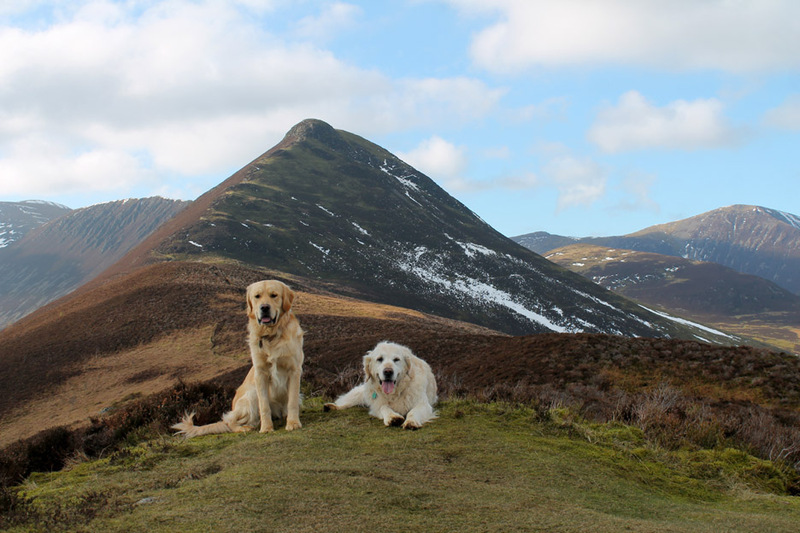 Highest point : Causey Pike, 2,089ft - 637m. 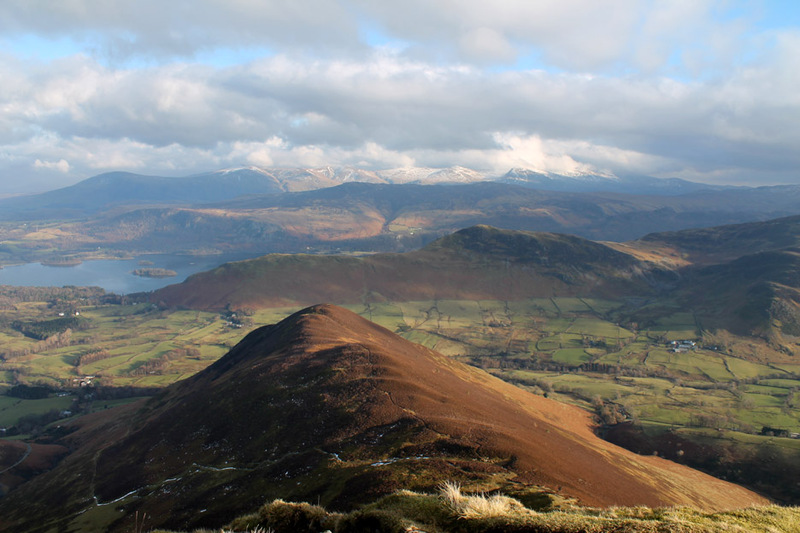 Weather : Sunshine and blue skies but some high cloud on the highest fells. 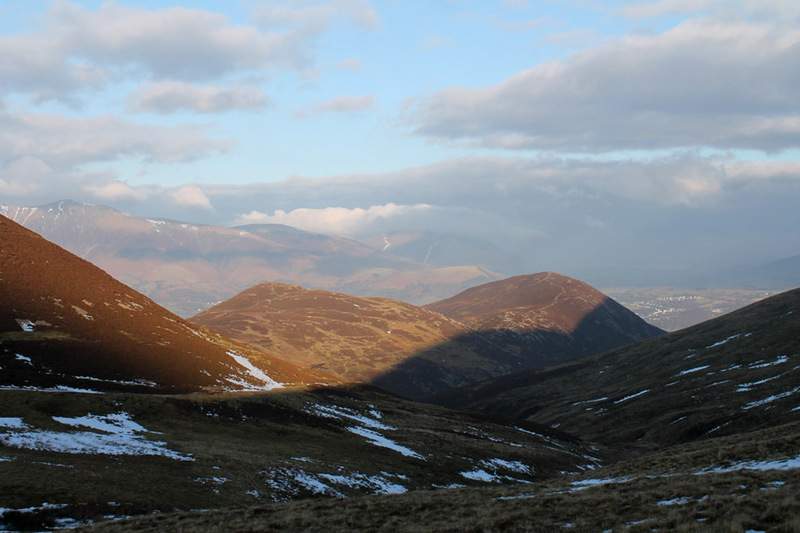 but the warmer weather of late has removed much of the snow from the lower fells. 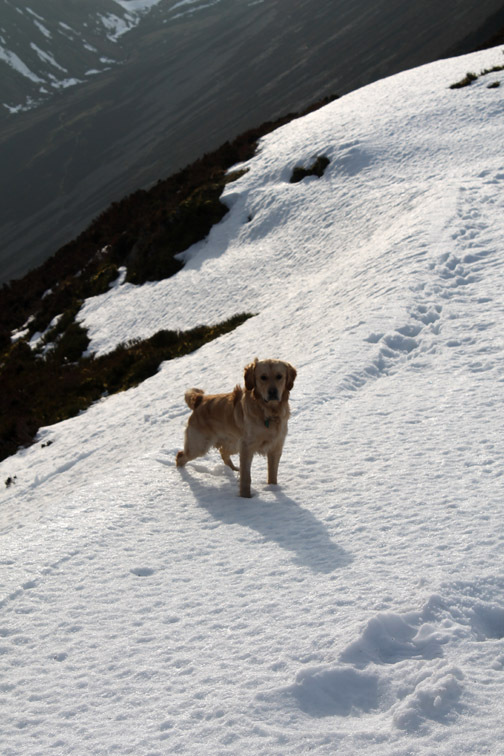 We pick a steep climb for a quick ascent. 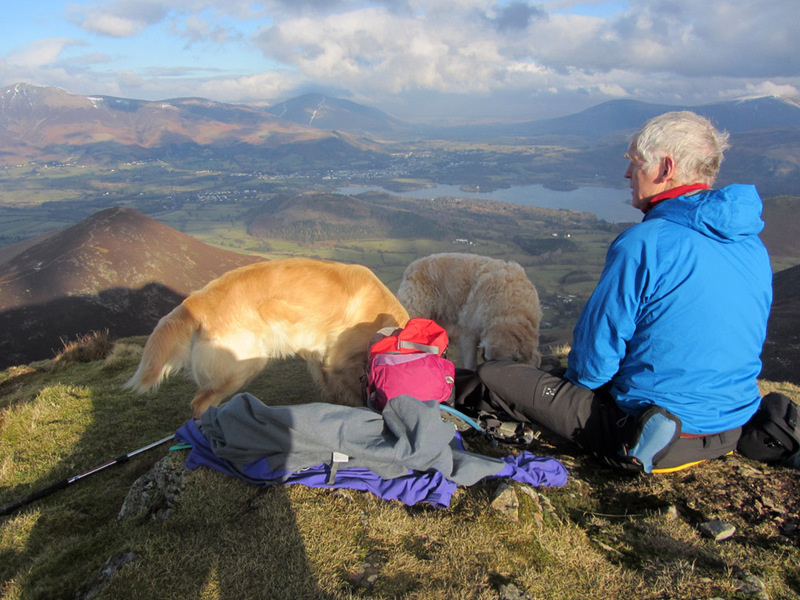 Lunch and microspikes are safe in the rucksacks ready for later in the day. 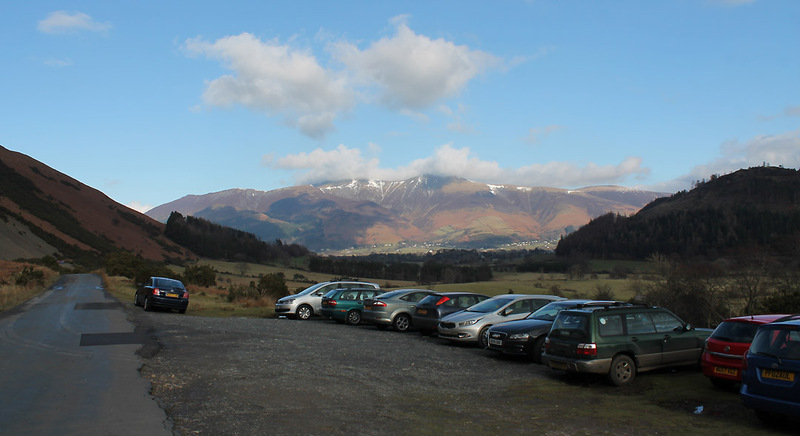 Road side at Stoneycroft but the parking area is fairly full as it is half term. Careful placing of the wheels in the muddy puddle means we have a dry area of grass for us and the dogs to step out. Decisions . . . decisions . . . Rowling End or no Rowling End. Either way we need to walk a short distance up the road to start. Our track back at the end would be the one above. 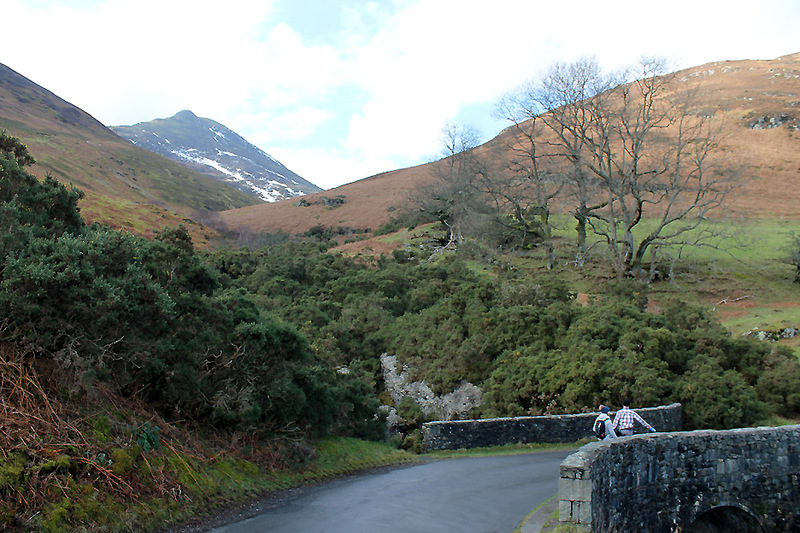 Stoneycroft Bridge . . .
. . . looking up to Causey Pike. 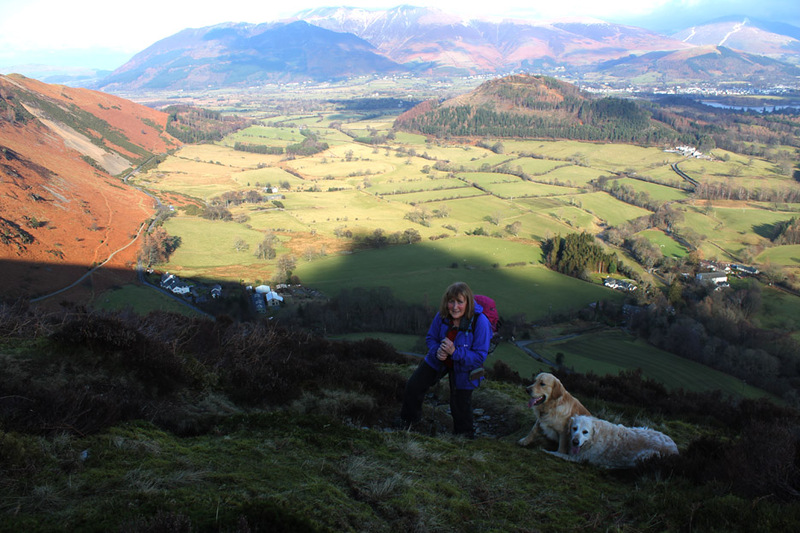 I was up here last year with my daughter but it has been nearly six years since Ann did the climb. 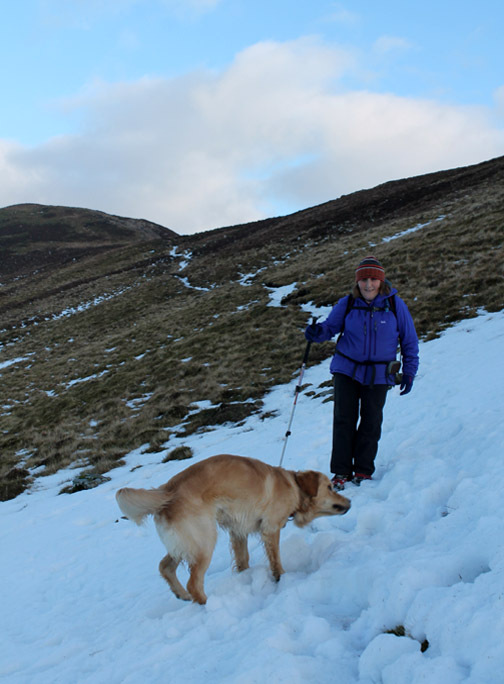 We chose the Rowling End path rather than the diagonal ascent to the coll. 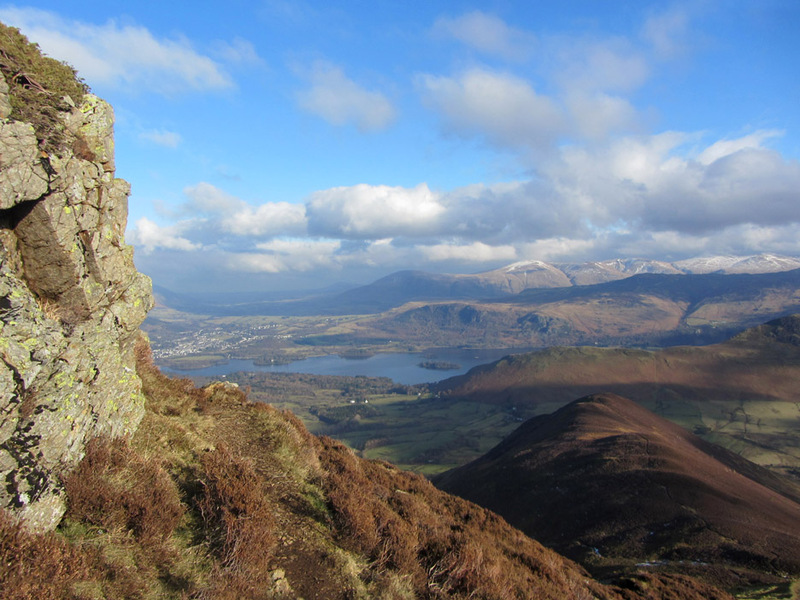 As a result we stayed on the end of the fell overlooking the road and enjoyed the more extensive views. 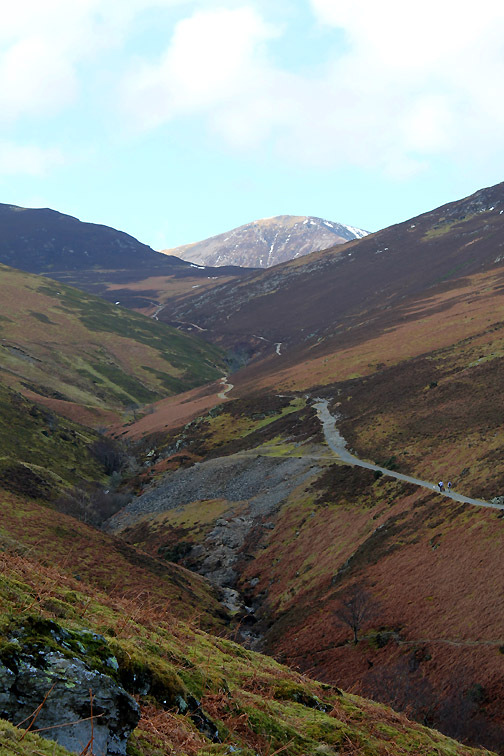 The old mines of Stoneycroft valley. Ann looking down on the houses and Outdoor Centre in Stair. This should have been a sunny picture as we rounded the end . . . but the sun went behind a slow moving cloud ! The distant peak through the gap is confirmed as Great End when checking the map. It is a steep ascent up Rowling End and after the recent damp weather it is rather slippery too. 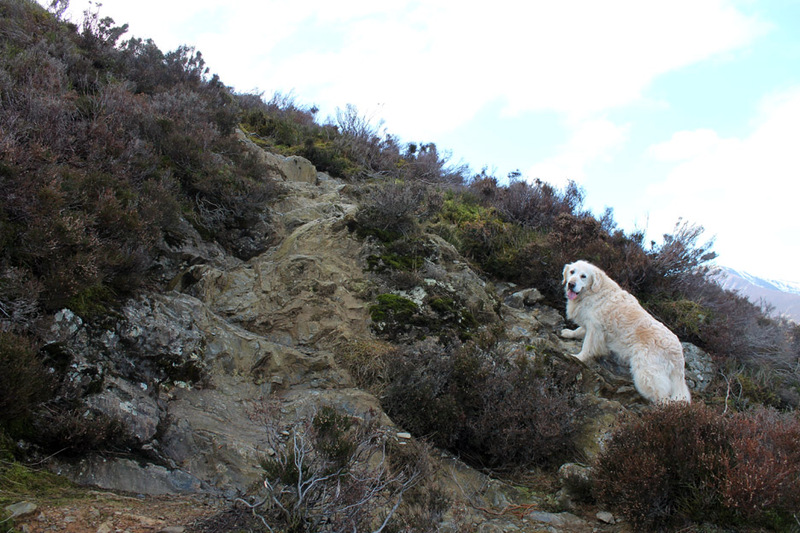 There are several abrupt little rock steps on the way up and Harry asks for help occasionally. They made it to the top of the first climb successfully . . . and pause for a rest and a photo. 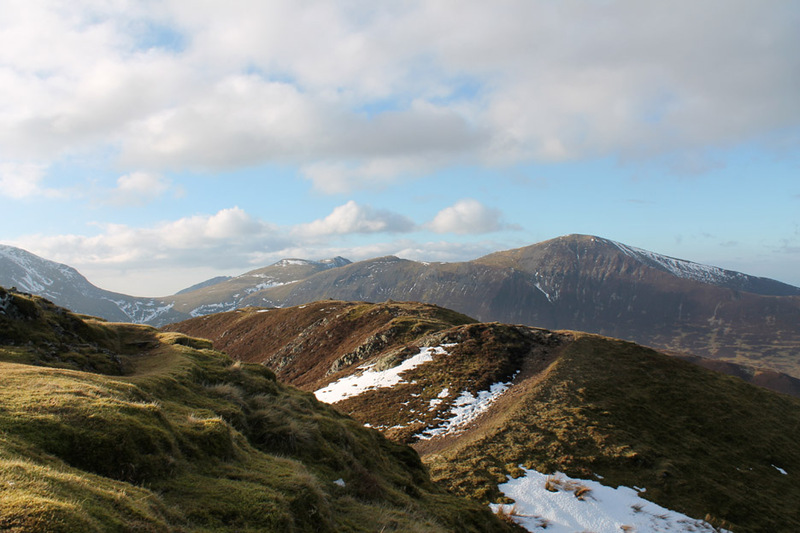 as the end of the ridge is a respectable 1400ft above sea level and has a clear views of its lofty neighbours. 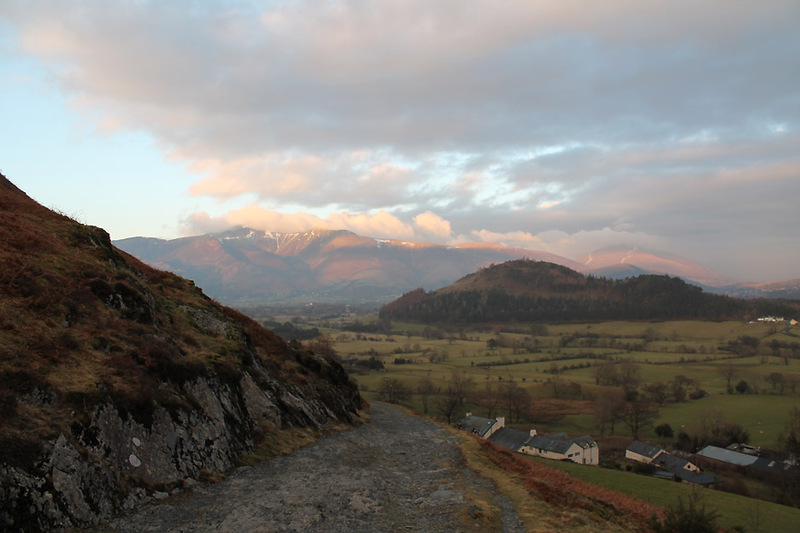 This is Carlside and the climb to cloud covered Skiddaw. 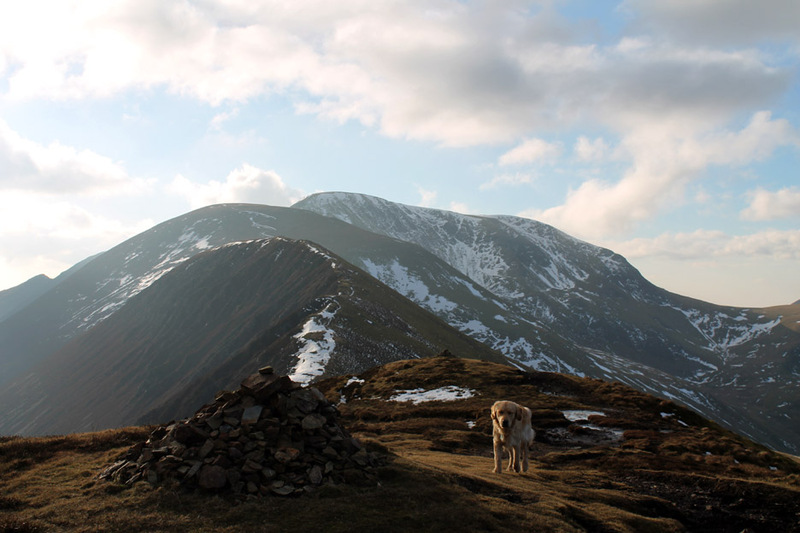 shaded as a result of cloud which first formed on the Helvellyn Ridge opposite and which has moving steadily across to cover it. 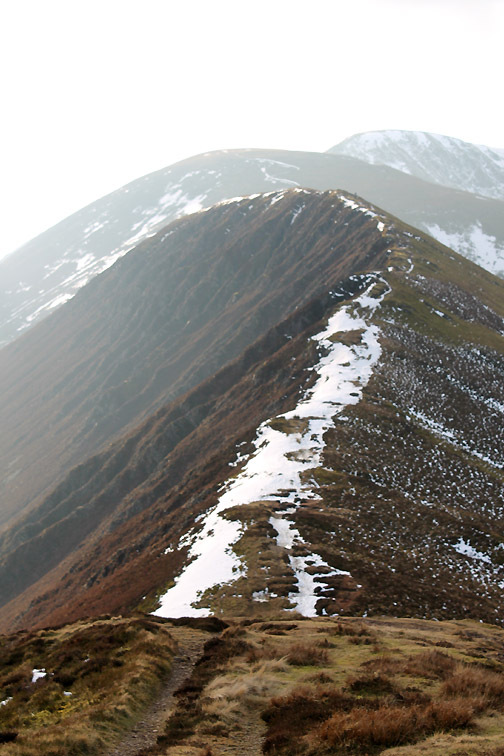 The lower slopes are bathed in sunlight but the summit ridge of Helvellyn is still forming that cloud. 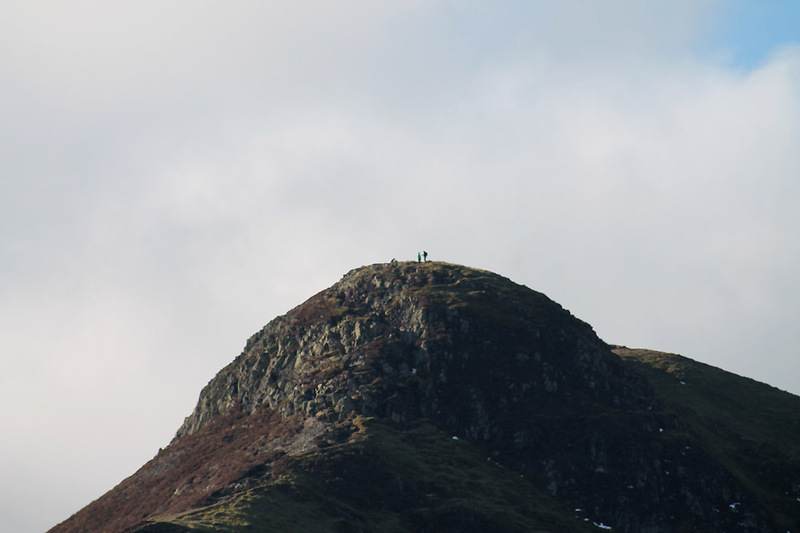 It seems a busy day on the summit of Catbells by the look of it. Zooming in on Great End again . 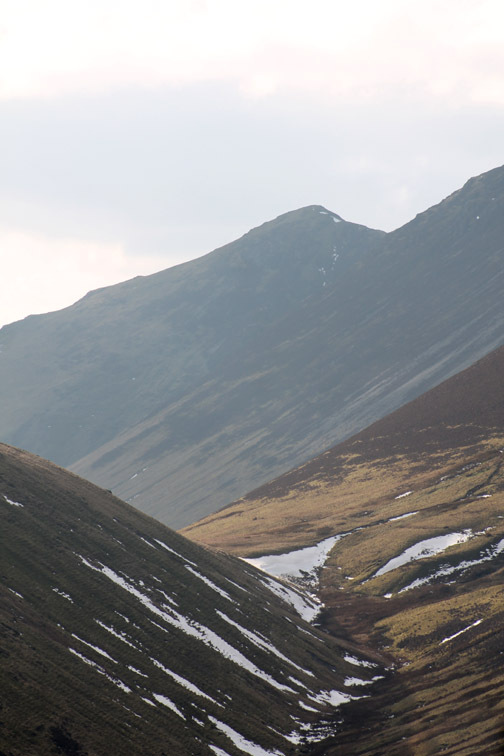 . . and Esk Hause and Esk Pike can now be seen through the Dale Head gap. 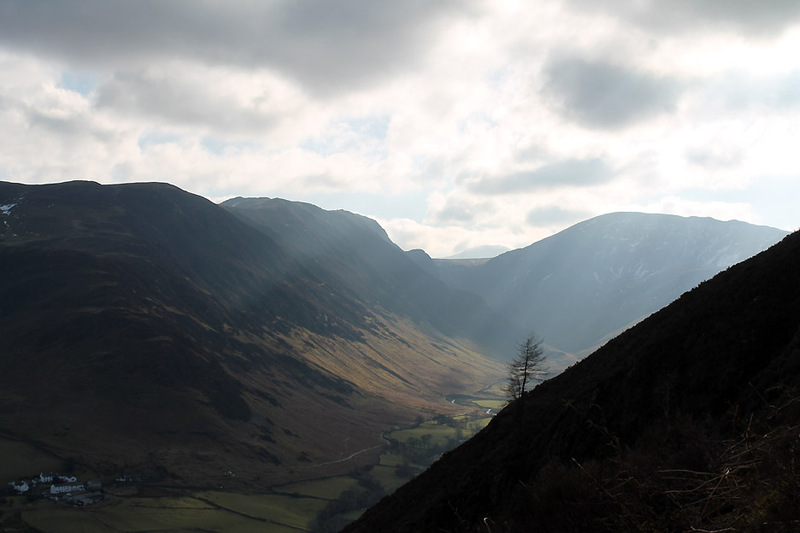 Into the sun and so High Stile lacks definition . 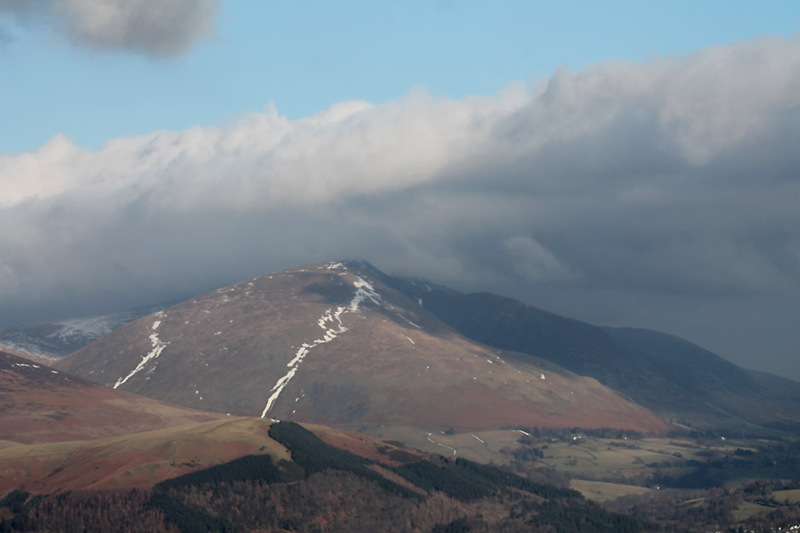 . . there's not much snow left, even on its north facing slopes. Oops . 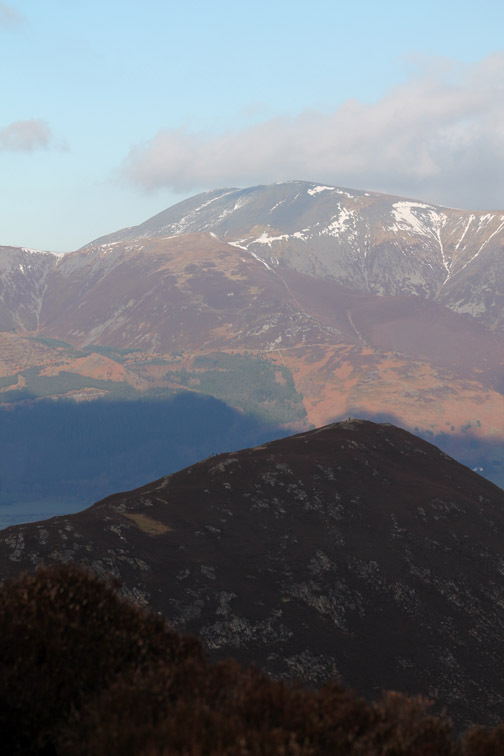 . . still got the big lens on for a shot of Causey Pike . 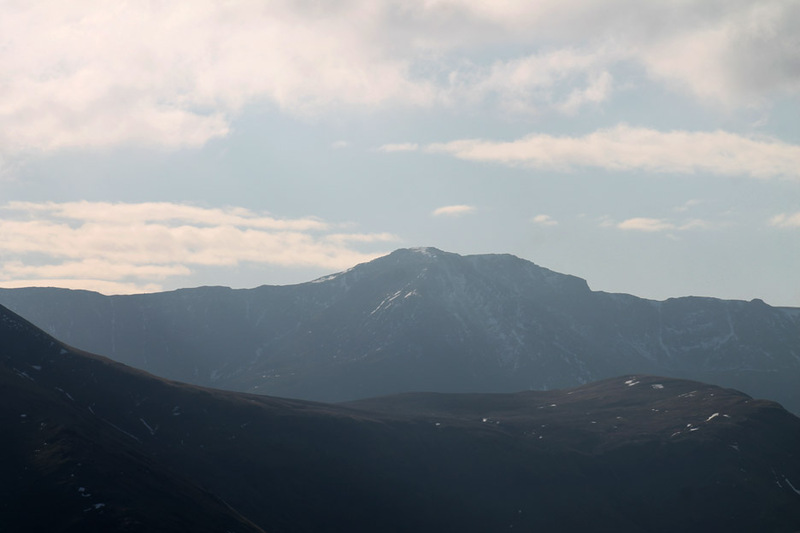 . .
so we see the detail of the upper crags and of two walkers on the summit. 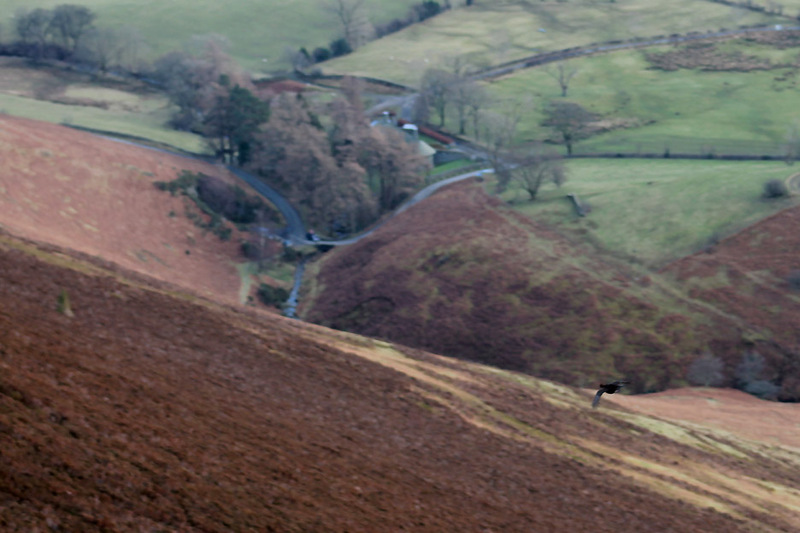 Changing lenses back gives a better impression . . .
. . . of the steepness of the climb ahead. 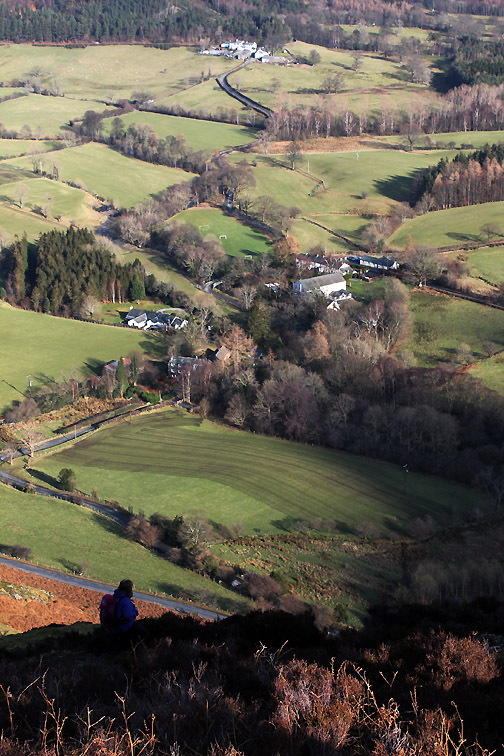 landing lower down in the heather, closer to the hairpin bends and the new 'Purple House' at Rigg Beck. 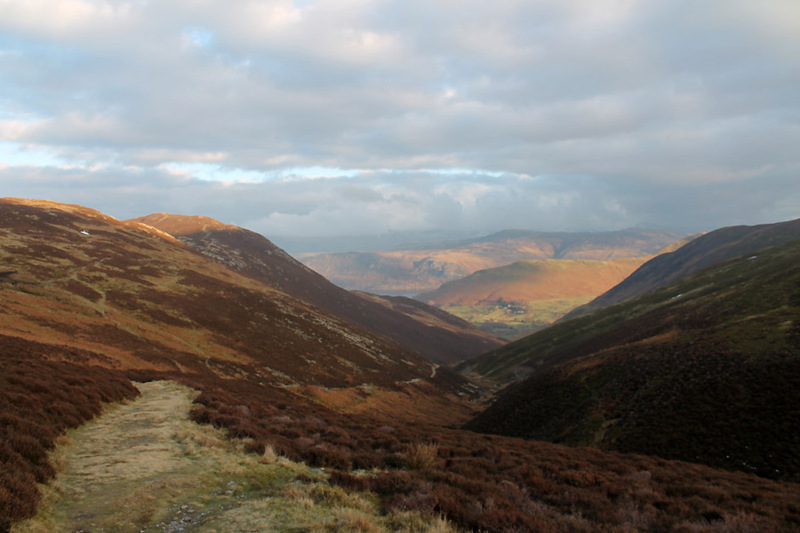 Rigg Beck, Ard Crags to the left, Wandope on the skyline. 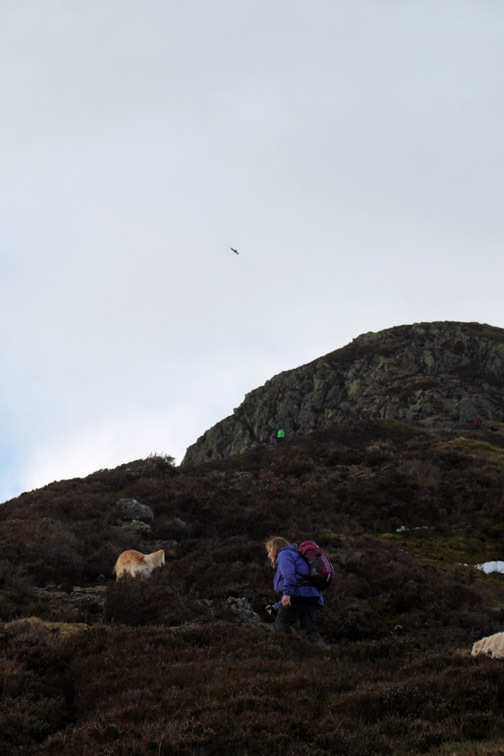 People on Barrow Fell as well. Nearing the final scramble to the top. 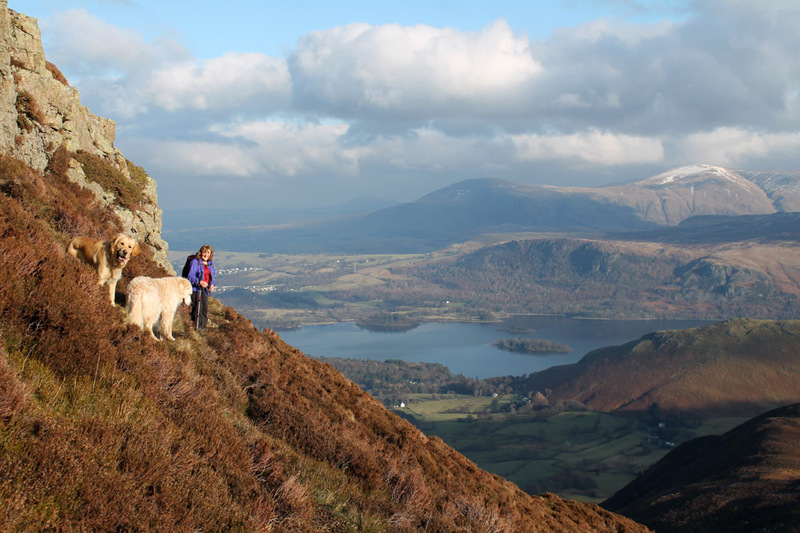 The view across to Derwent Water and the Dodds is superb. 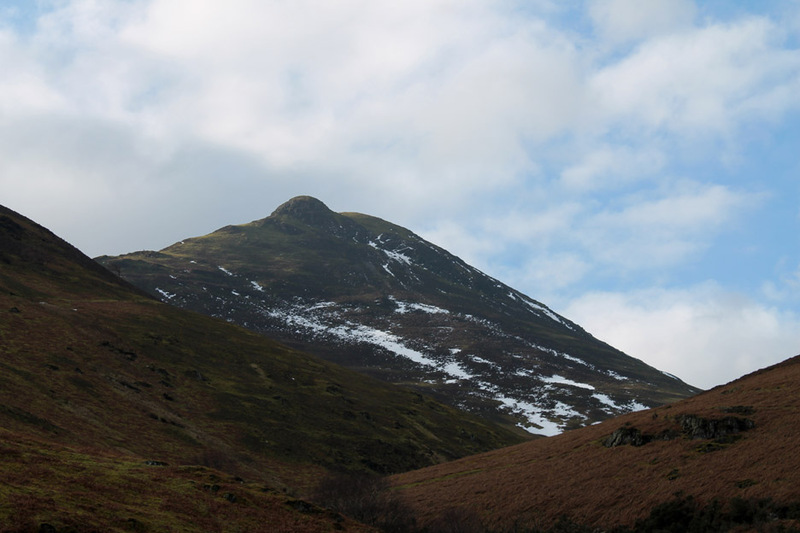 So we double back and climb the final rocky band to the summit. 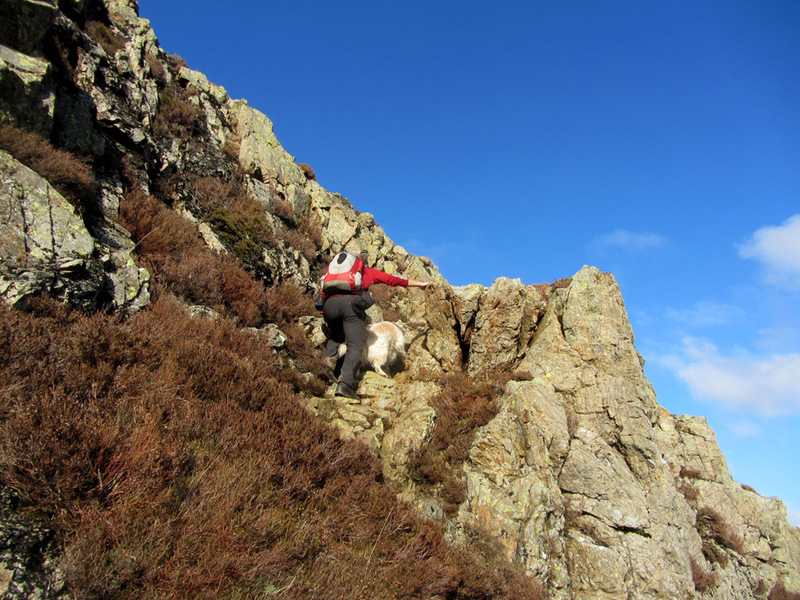 Everyone successfully up the steep rock gully . . . so time once again to stop and enjoy the view. 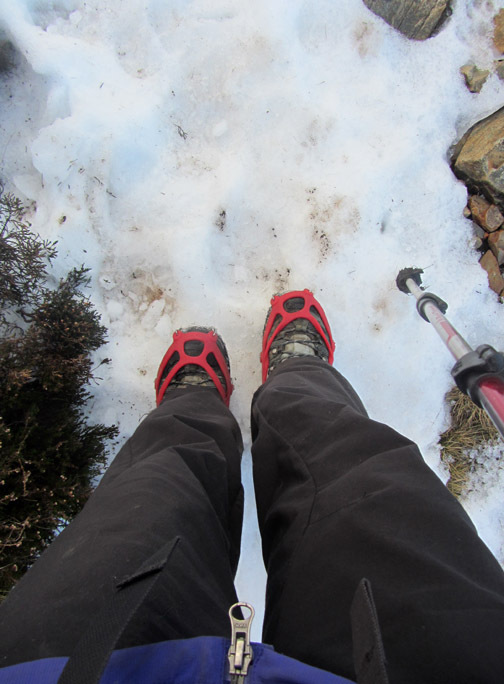 We travelled up via the ridge path, the direct climb to the hause being the one outlined with patches of white snow. The summit cairn and Dylan is there first . . . of course. Time to grab the sandwich box and thermos for a well deserved lunch. Not a bad viewpoint . 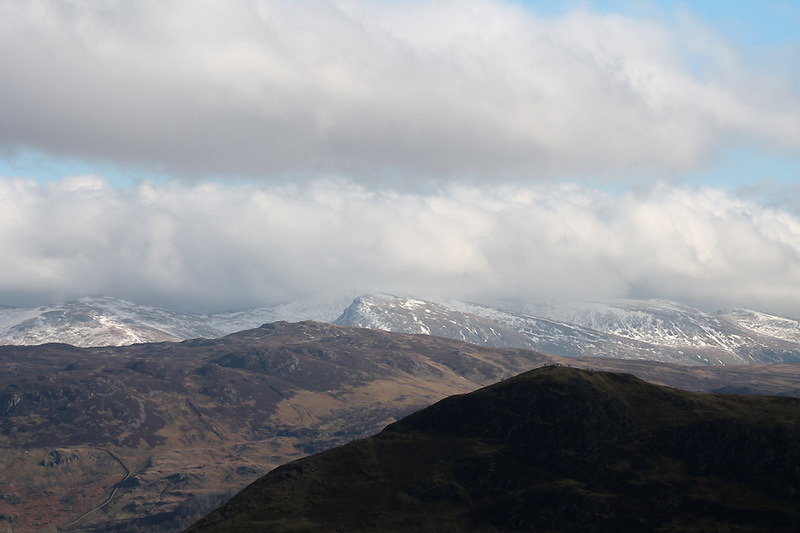 . . suitably clear of the actual summit area. Can't stay here all day so once lunch is over we make a start on the second half of the walk. 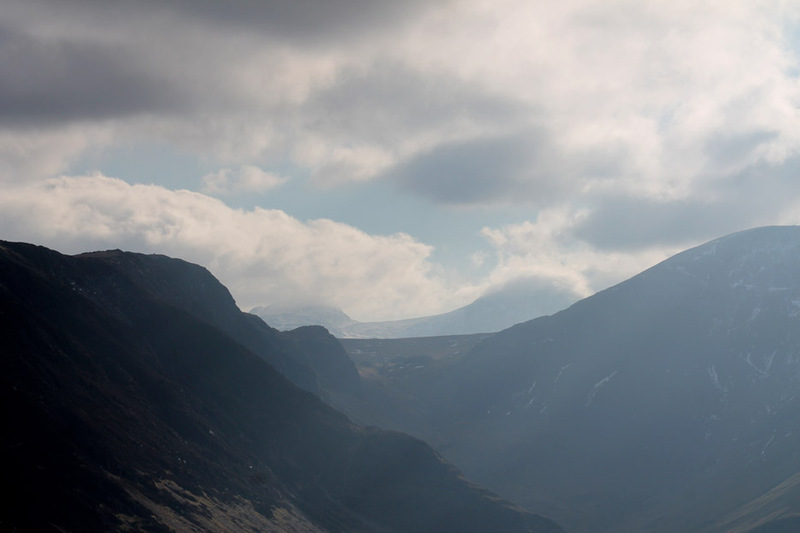 The snow-etched ridge leading along Scar Crags. 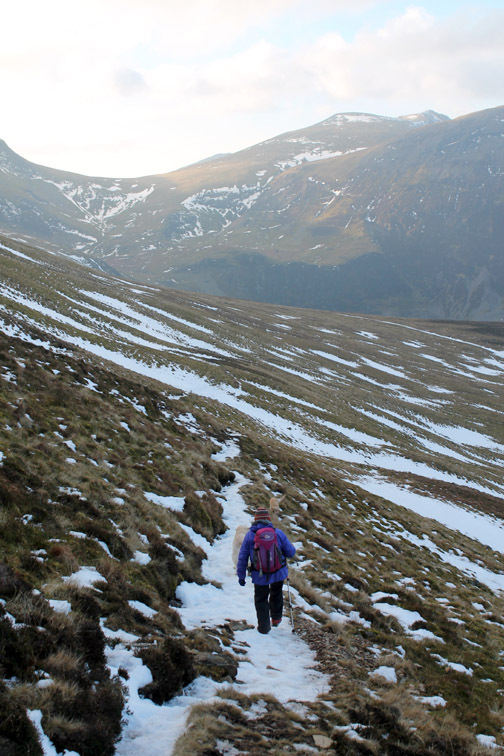 In view of the time we pass on walking more of the ridge in favour of a gentle descent to High Moss. Dylan catching snowballs . . . Ann enjoying the snow . . .
. . . made easier by the application of spiky science. The dogs have their own built in spikes . . .
. . . as we continue down to the hause. 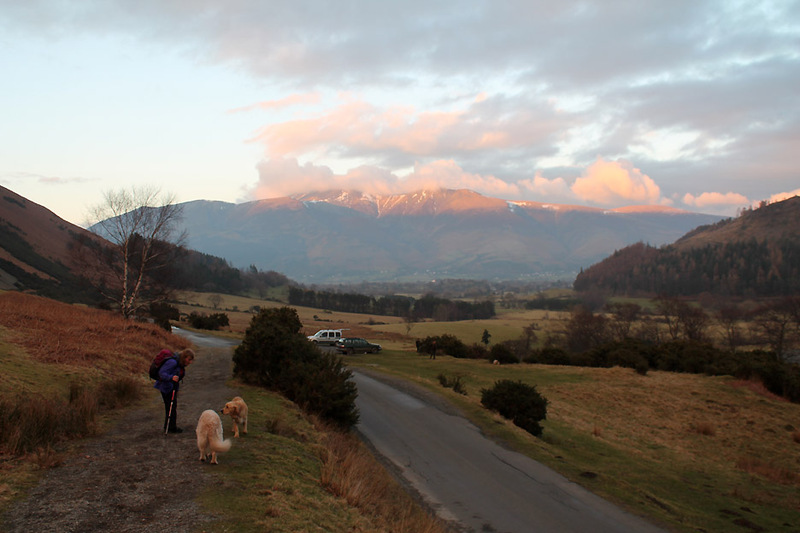 as we reach the old Miner's track and start our way down. Into the shadow ourselves now as we continue the steady descent alongside Stoneycroft Gill. 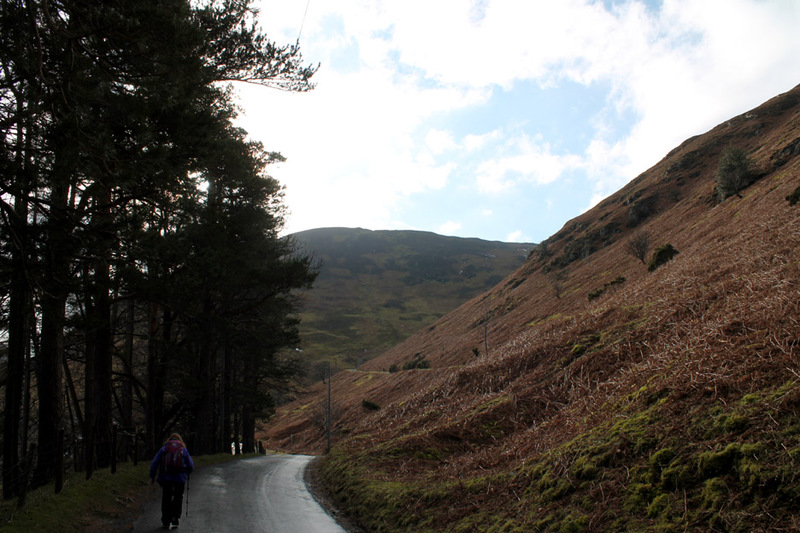 Nearing the final turn at the bottom of the valley. 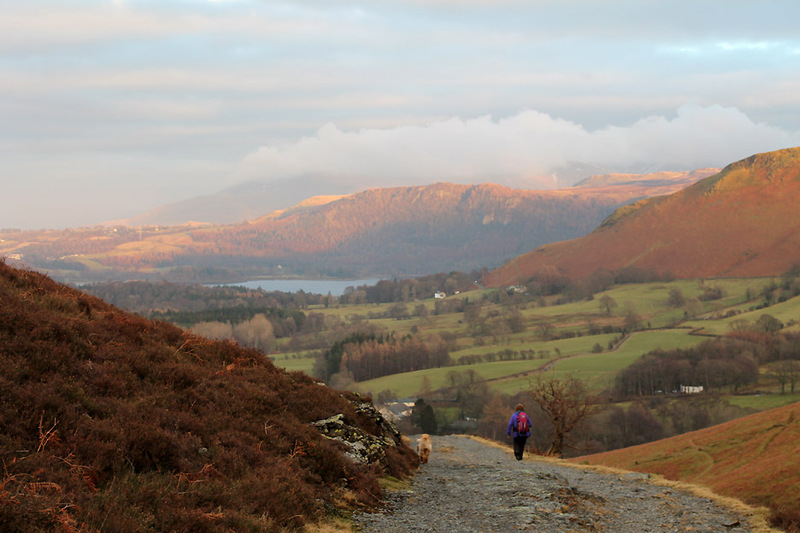 Ahead the sunshine highlights Walla Crag on the other side of Derwent Water. 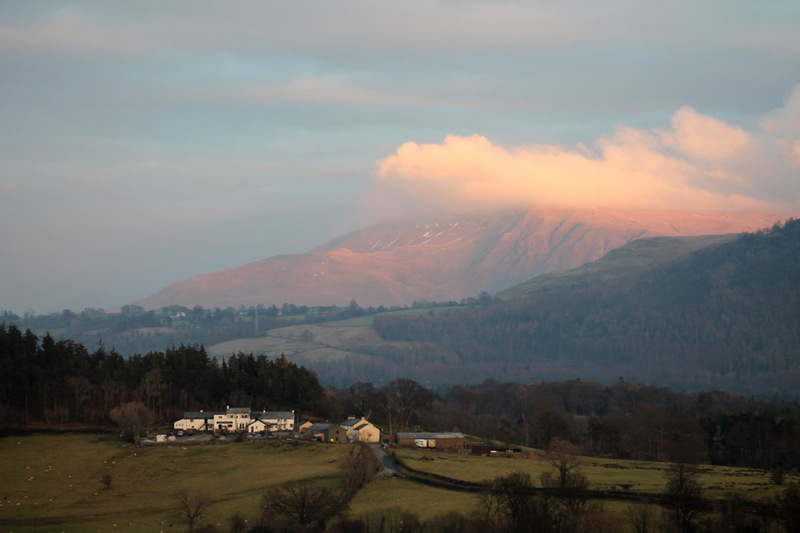 The Swinside Inn below is in the shade, but the cloud on Clough Head is catching the late afternoon sunshine. 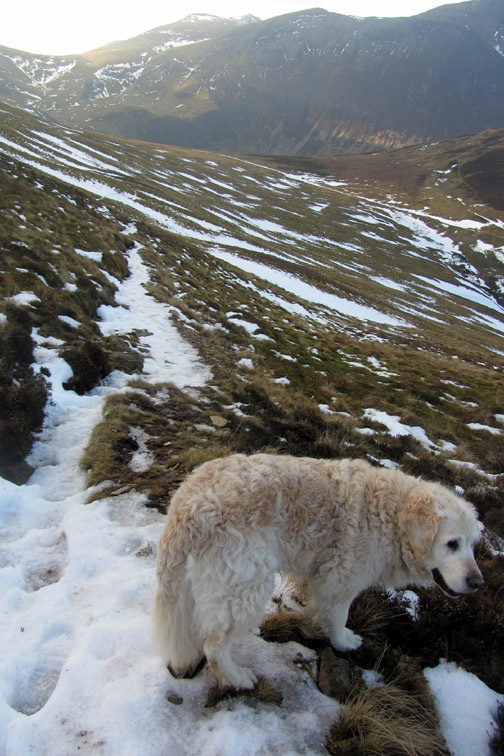 The wide track, much smother now below the old mine workings, leads us down toward the car. Ann is having a word with Dylan . 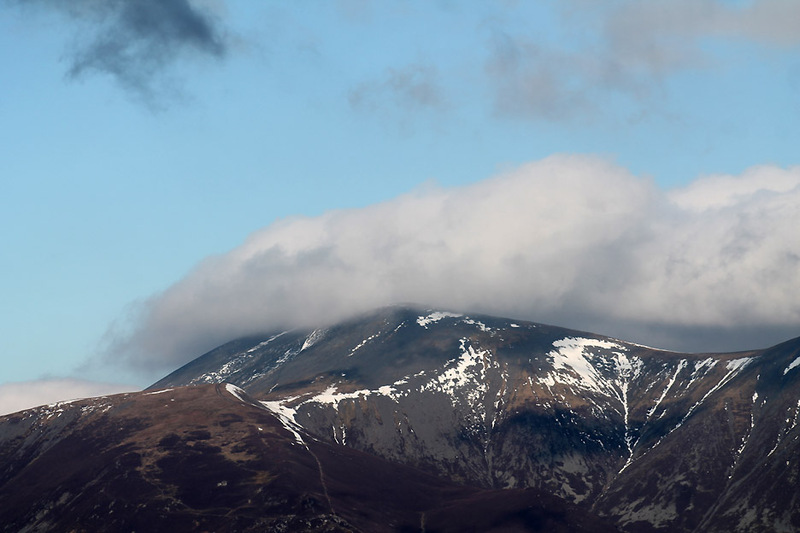 . . but it will not be about the lovely cloud and sunshine over Skiddaw and Lonscale. There's only one car left apart from ours and they have a dog that Dylan wanted to meet. Time to do that once we cross the road ! Technical note: Pictures taken with either Ann's Canon Sureshot SX220, or my Cannon 1100d digital camera. This site best viewed with . . . room in the pack for all the things we'll need on the day.